The mind who moves through the macrocosm at will. In the spiritual significance of numbers, these are the foundations for the numerology meanings of the psychic Number 7. As the seventh of all numbers, 7’s symbolism is the mind and its infinite possibilities. 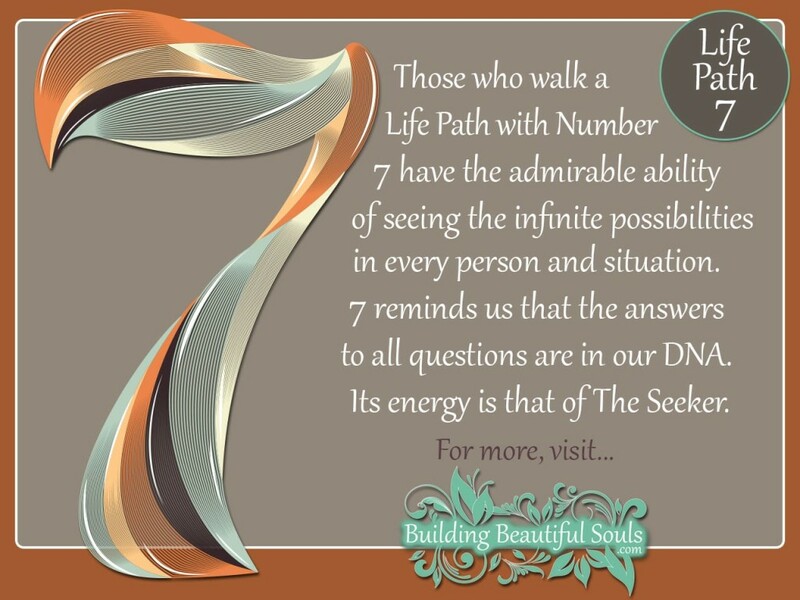 Those walking a Life Path number 7 are smart problem solvers with visionary potential. Exacting science enthralls this curious soul. Ever thinking, the 7 takes rigorous steps to figure out puzzles. In your youth you were the kid who didn’t put down the Sunday crossword for anything until it was done to perfection. Your deep desire for completion is what endears you to others with projects. When a 7 is around the task will get done, the matter is ‘when’ it gets done. Forget deadlines with this seeker. The 7 life path could be considered the Tin Man of sacred numbers as they walk the Yellow Brick Road – somewhat immobile and rusted emotionally. This is why they often choose flying solo, content to roll ideas around in their mind rather than socialize. This makes 7 mysterious to others. If this is your life path people may see you as very private to the point of aloofness. Part of that is your desire for perfection in those you choose for your Circle (if anyone). Rather like an atom, you keep a lot of folk in your outermost zones (and even then, those people are only present because they’re useful to the Tin Man’s quest). The love of solitude often attracts the 7 into spiritual pursuits where they can retreat to the mountain top and learn the secrets of true living. This may work for the 7 for a lifetime, but many find that there’s still a natural hunger for some type of intimacy. The challenge in this incarnation for the 7 is figuring out how to balance out this dichotomy. As a child the 7 would skip rocks not to count how far the stone got, but to watch the resulting ripples. The 7’s mantra is “nothing is only skin deep”. They will look for those very same ripples in every moment, every experience which has the benefit of catching information that others overlook. In Numerology, the Number 7 symbolizes The Seeker. There is no end to this number’s sense of curiosity. A person governed by 7 never accepts things at face value, feeling that much of life is superficial. They yearn to see what’s behind door number three and the man behind the curtain. 7 thirst for truth. They’ll often hang toward the back of the pack, having rather awkward (or misunderstood) social contrivances. And while the 7 represents intelligence, it’s not always obvious to the on-looker. Consider that Stephen Hawking is a 7. So was Diana, the Princess of Wales who was shoved out of the shadows from her shy ways. Rasputin and Picasso were also governed by the number 7. It is not surprising to find 7 vibrating positively with metaphysical pursuits. It’s the perfect place to study life’s nagging questions and begin a quest for Universal Truths. Faith in various spiritual gifts cannot be proven, but they’ll do they’re darndest to try. Religion is a whole other critter, however. 7s really don’t like dogma and a faith that sticks to concrete redes holds no interest whatsoever. In the world of magical numbers, 7 is supposed to be lucky. Perhaps that luck comes because these people avoid those who choose random blather based on half-truths as well as people prone to manipulative betrayal. Shallowness has no place in the 7’s life. For all that, 7 still knows how to laugh at life. If this is your keynote number you probably have a very wry wit, but one that many people won’t quite “get”. In this the 7 is a very eccentric spiritual number who cares little for physical activity but loves strategy, planning and analysis to the point of utter distraction. These can be laudable traits but there are two drawbacks. First, it’s hard to pull a 7 away from their current “hunt” and back into the real world. Secondly sometimes they find an answer that isn’t actually there by cobbling together obscure information that no one but 7 understands. In social settings the 7 may bemoan their frustrations, but give no time to the problems of others. Empathy is not a strong [personality trait here. And god forbid the 7 gets sick. They’ll scare away even the kindest of souls with vexing demands. The real gift of the 7 is their mind. When this person uses their imagination and keen research skills they can achieve greatness. From a Karmic perspective 7 is a good place to settle in. These souls strive to raise their vibrational levels by tapping into the patterns of life itself. Nonetheless, the 7 may not see themselves as anything special or unique. They are simply following their quest toward what they see as a natural outcome. When not engaged in that endeavor, they’ll happily elaborate on the visionary concepts to those who will listen raptly. The 7 is an odd bird, often seen as a visionary or sage (or crazy elder) because the level of mental activity often confounds others. People recognize you as having “something” they’re just not sure what it is. Metaphysically you may be drawn to Sacred Geometry, Angelic studies or Parapsychology, all of which are good choices for destiny number 7 – those etheric, just out of grasp concepts keep your mind active. Note that if you have 7 walking with you as a Destiny Number you may receive a lot of information in your dreams. This is the time during which your brain “downloads” all the data it has gathered even without your direct awareness. Pay attention to those messages and keep a dream diary so you can study and interpret your dreams later. The soul of a 7 loves solitude. They know that in the quiet, uncluttered moments the mind can see truth and hear God. This is why 7s often retreat, much to the frustration of those that love them. When a 7 is in your life they will need cave space where their brain percolates into brave new worlds of thought. This is healthy and necessary for 7. When they don’t get this time be ready for irritability. A small shack at the sea is one great choice as a retreat for 7. Warning: encourage the 7 to check in while they’re soul searching or they’ll lose track of time on the next wave of thought. If there was ever a mystical number in need of a owner’s manual it’s a 7. Unfortunately, when you find the book it reads like stereo instructions! Even with their cognizance, there is a softer side to 7 very capable of good deeds and even romance. The soul of a 7 gravitates toward people with solid ethics and values. They can unflappably debate the most intense of minds and remain wholly cordial. Throughout this incarnation the 7 will continue to strive after the Mysteries be it in their own back yard or half way around the world. A challenge for this Soul Number is weighing the benefits of the quest against the time and materials, let alone the isolation. When woolgathering 7 sometimes forgets that others may have a piece of the puzzle they’re missing. If the 7 puts down a personal quest long enough they can fall in love quickly, sometimes pushing a relationship too far too soon (as if “feelings” were yet another sphere of exploration). Once in a relationship the 7 personality needs reassurance. As parents they are very committed to being good providers, but may go overboard even as with the love declarations. For leisure the 7 enjoys strategic games like chess and heady books (typically non-fiction). The environment around a 7 is oddly comfortable considering how organized they are mentally. Should the 7 step out of their shell somewhat, people will inevitably invited IN rather than go out. Home sweet home has deep meaning for the 7 so when they do open that door, treat it respectfully and you may just gain a friend for life. Because of their love of knowledge it’s normal to find 7s in math and science, often as those on the cutting edge of new ideas and technology. They also fare well in legal fields and public speaking. If they can combine any of these careers with the intense desire to travel, 7’s will find great satisfaction. Their independence means that whatever position the 7 seeks, he or she prefers to work alone without micromanagement. Tractability isn’t a term 7 uses. They have very firm standards and ideas about how things should be done, which would make them difficult as an underling in a corporate setting. Additionally the 7 takes their sweet time with tasks. Don’t try to rush genius, don’t ya know? 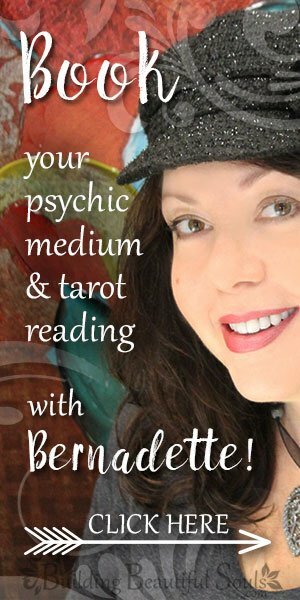 In Tarot Card Meanings and symbolism the Number 7 is associated with The Chariot Card in the Major Arcana. The classic Rider Waite tarot card deck depiction of a single Charioteer ‘driving’ a chariot yet doing so with no reins symbolizes the soul (Charioteer) driving the body (chariot). This card speaks of conquest characterized by a battle between ego and action; internal and external; mundane and divine. With such powerful forces at work in the 7, it’s no surprise they have a strong desire to achieve goals, but it won’t be without obstacles, one of which may be they’re tendency to try to win battles alone. You’ll note the Chariot has only one driver as the card’s symbolic meaning is also that of receptivity to the divine will of of the one Source. I’ve bought a superhero cape just in case! 😉 Thank you for taking the time to comment on Numerology 7 and thank you for visiting BuildingBeautifulSouls.com! Apologies for the tardy reply. Was on vacation. So happy you found truth! After all, that’s most of us are seeking. 🙂 Thank you for visiting BuildingBeautifulSouls.com! Hello!i never understood my reactions sense a was a child,i found it in Numerology today!my Zodiac sign is Chariot,i’m Life Path 7,Birthday 19/11.i find truth but i still need to understand deeply! !can you please find a video which show these kinds of reactions? No worries! I’m here whenever you’re ready! B’day 5 ,life path 7 ,zodiac sign Libra…my career?? Libras with a Life Path 7 would do well in any kind of career where their job is to see the big picture and the infinite possibilities. So, maybe a software engineer, head chef, social media manager, museum curator, or conservationist – to name a few. I am pisces and my soul number is 7 i am a deep thinker about everything in this whole universe but i still dont know the meaning of my life like what i am doing here, what i have to do with my future if you know something about pisces with numerology number 7, then i request you to tell me. How would a life path 7 be with another 7, are they compatible? Also my life path number is 7, destiny number is 1 and my birthdate is 12 May. I’m going to study Psychology at university. Is this a good career for me?